I recently spent a week (19 - 25 January) in the Gambia together with a bunch Norwegian birders. Gambia was no less than wonderful, both in terms of birding, photography and leisure. The birding was concentrated to the Western and Lower River regions of Gambia, and we had our base at the fantastic Footsteps Eco Lodge near Gunjur (see the map). I have not summarized the obtained species number yet, but ended up with a bit more than 200 species during the week. The highlights were many, and I did a lot of bird photography. 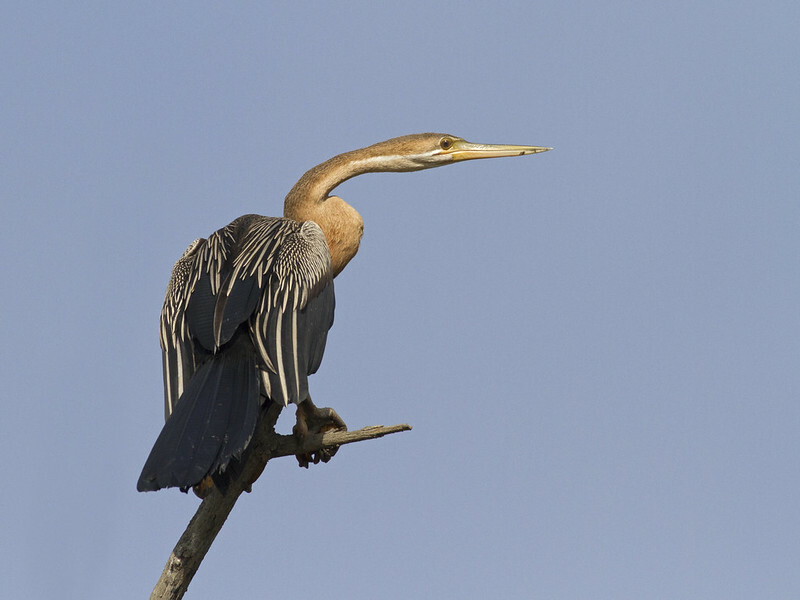 Visit my Gambia gallery to see some of the feathered delights that crossed my path. The gallery is not complete, but pictures will be added continously. A month ago I stumbled across an intriguing large white-headed gull at lake Tveitevann, Bergen, western Norway (map). When I arrived at the location I saw the bird at quite some distance, but its appearance got my attention. The camera was on my shoulder, and i fired a few record shots before I turned my head into my rucksack to fetch binoculars and bread. That process probably lasted for only ten seconds, but when I was ready to study it more it was gone. I scanned the area, but it had vanished. Darn! I really wanted to see it better, and of course in flight. Putative second winter Caspian Gull (Larus cachinnans) in Bergen, western Norway 10 December 2012. Note especially the white head, long primary projection and bulging belly. Click on the picture to see larger and more pictures. The bird was a second calendar year, with an outstanding white head and long primary projection. The wing coverts, especially the greater and median coverts, were rather different than Herring Gulls at this age, as was the coloration of the bill. The species I was aiming at was Caspian Gull. At least it gave a caspish feeling. The pictures were transferred to the computer, studied intently, and I concidered it to be a candidate for Caspian or maybe a hybrid between Caspian and Herring Gull. I was worried about the moult progression, which was less advanced than a classic Caspian. I decided to send a few shots to some friends, and they did all support my thoughts, but none were conclusive. The pictures did only show the bird from its right side, in a standing position. Documentation of the spread wing, underwing and tail was necessary for further analyses. 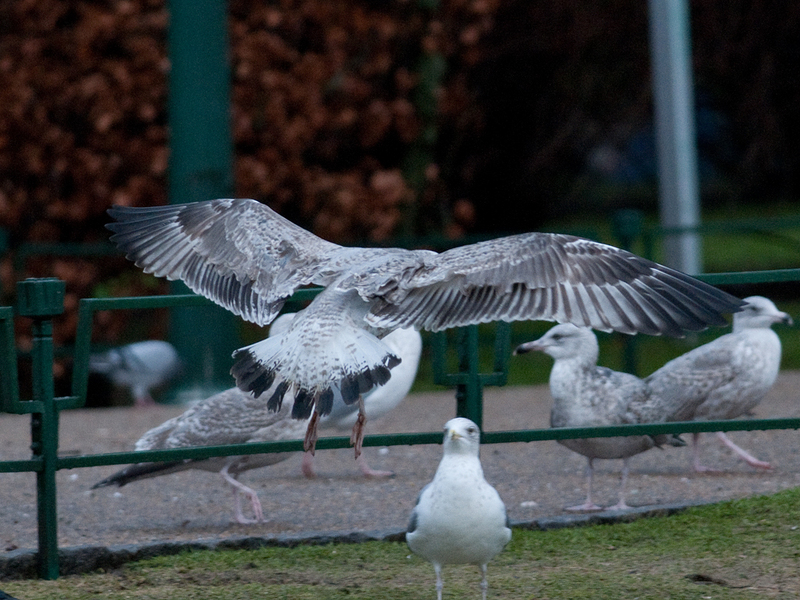 Despite several people looking at gulls in Bergen, it was not relocated - until the fifth of January. 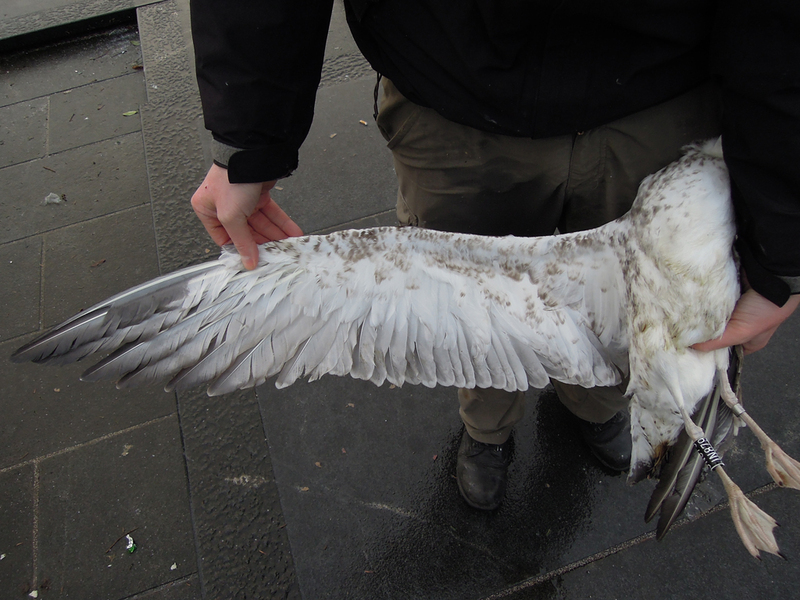 Then the bird was caught, ringed, measured and a blood sample was obtained. The new pictures did show all the stuff I wanted to see in the pictures I did not get in December: white underwing with a few dark spots (link), black rather narrow terminal band on the tail in contrast to white bases and a white rump with a few spots (link). Several other more discrete Caspian features was also revealed, but the bird was of course still rather retarded in terms of moult. The bird was presented to several people with great knowledge of Caspian Gulls, and the feedback was positive. The conclusion is that it is well within the range of a Caspian Gull. In due time the blood sample will be analysed and the birds specific status will be certain. Thanks to Arild Breistøl and Christian Pedersen for ringing the bird and obtaining more documentation, and Jan Jörgensen, Chris Gibbins, Morten Helberg, Hans Larsson and the Gull Research Organisation Forum for feedback and comments.